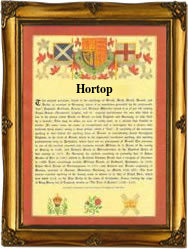 Recorded as Hartop, Hortop, Hartoppe, Hartupp and others, this is an English surname. It is of locational origin from Hartsop, a parish and village in Westmoreland, five miles north-east of Ambleside. The placename itself probably derives from the pre 7th century words "heorot", meaning a stag, also used as a nickname for someone bearing a resemblance to a stag such as a fast runner, and "topp", a hill top, hence the top of Stag's hill. Locational surnames are often "from" names. That is to say they were names given to people who moved away from their original village, and thereafter were called after it. The further they moved, the more likely that the spelling changed. In this case the church registers of the city of London include examples such as Joan, the daughter of Thomas Hartoppe, christened at St. Vedast, Foster Lane on April 22nd 1582 whilst Thomas, the son of Thomas Hartop was christened at St. Dionis Backchurch, on September 20th 1678. Even further south at St. Mary Magdalene, Canterbury in Kent, Joseph Hortop married Anne Dunnye on January 23rd 1625. Sir John Hartopp, the third baronet became M.P. for Leicestershire in 1658, during the "reign" of Oliver Cromwell who died that year. He was also an alderman of London and left an endowment for the education of dissenting ministers. Surnames became necessary when governments introduced personal taxation. In England this was sometimes known as Poll Tax. Throughout the centuries, surnames in every country have continued to "develop" often leading to astonishing variants of the original spelling.